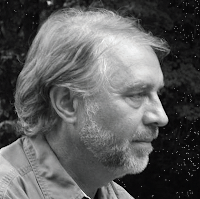 Chard deNiord is the author of three books of poetry,Night Mowing (The University of Pittsburgh Press, 2005),Sharp Golden Thorn (Marsh Hawk Press, 2003), andAsleep in the Fire (University of Alabama Press, 1990). A new collection, The Double Truth, was published from The University of Pittsburgh Press in late 2010. His poems and essays have appeared recently in the following journals: New England Review, Literary Imagination, Salmagundi, American Poetry Review andThe Hudson Review. He is an associate professor of English and Creative Writing at Providence College and cofounder of the New England College MFA Program in Poetry. He lives in Putney, Vermont. If fish are notes in the river, then the song is never the same, even if the water is. Heraclitus was wrong. The current is motion is all. You touch a dancer as she pirouettes and she’s still the same dancer. So there is a song that never gets played because the fish are always swimming in a way that rejects notation? If they stopped where they are right now, would they configure a song? Are they swimming, therefore, forever toward a melody? If so, you could say then that any song is the prescient catch of a school of fish at various depths, a quick and natural analogue for composition, the trout song, the bass song, the perch song. But the mind is the antinomy of a river, says Mr. Tsu. It is not the song beneath the surface that the fish suggest, for those songs never exist in time, but the fixed clear notes above the surface that are pinned to a sheet, on bars. The music we hear is played by musicians who have learned the difference between an idea and a score. So, Kepler was wrong also about the spheres, and Scriabin about the spectrum, and David about the hills. None of these things contain music. Only the mind thinks they do. Only the mind would ruin their silence with a symphony.